Sennheiser’s high-end Momentum model headphones now support Bluetooth, and NFC. Sennheiser has updated its Momentum model of premium headphones, with Bluetooth and NFC capabilities. that is bound to launch in January 2015. The high end headphones that are scheduled for launch this month, were showcased at the on going CES 2015 being held in Las Vegas. “The Momentum headphones represent our uncompromised vision and passion to go further and push for something even better. They are for people that share this spirit, demand the best and refuse to compromise – delivering sound quality, progressive technology and high-quality materials in a product that is built to last,” said Charles Cha, Product Manager at Sennheiser Consumer Electronics. The second generation of Momentum headphones now offer wireless support for the first time. The 3 new headphones, launched in over the ear and on the ear variants, have a brushed stainless steel headband, which is based on existing designs. The wireless headphones will retain the same noise cancellation features as the wired ones, along with the older generation hardware . The battery life of the headphones according to Sennheiser is 22 Hours. The on the ear Momentums will be priced at $399 (Rs. 24,500 approx. ), while the over the ear headphones will be launched for $499 (Rs. 30,600 approx.). The over the ear headphones are expensive because they use real leather on the earpads, and are bigger in size. The new generation of the Momentum headphones are foldable and come in a carrying case, along with two cables, one of them designed for use with Apple products. The latter cable has an inline microphone and a 3 button remote.The models will come supplied with a charging cable and a flight adaptor as standard accessories. Sennheiser claims that the headphones will also provide excellent sound quality via apt-X codec, but the feature only works when connected to an apt-X connected Bluetooth device. 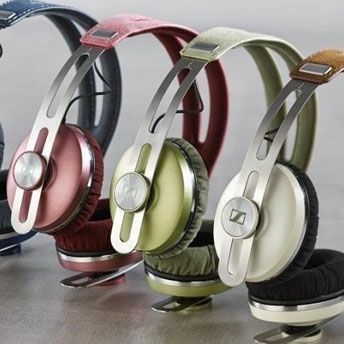 The headphones also offers NoiseGard powered noise cancellation technology which uses four microphones built into the headphones to monitor and block ambient noise. The headphones will be available in Black and Ivory colors. Sennheiser has also updated its Urbanite XL headphones with Bluetooth and launched the Momentum in a classic Brown edition that is optimized for Apple’s iOS devices. The wired Momentum On-Ear will be available in Black, Ivory, Brown and Silver from January 2015.